When it comes to complex family tree, PedigreeXP is your best ally. 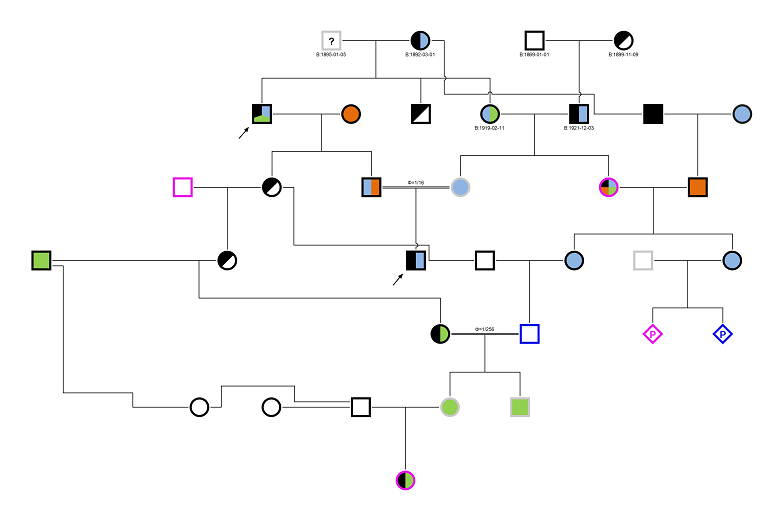 With just a few clicks, easily draw complex and multiple relationships spanning over generations, to better visualize the family history and the risks that may result. To begin, you should always start with linking two persons as ” Spouse” as the default relationship type is set to “marriage”. To do so, select a member and the hint with the relationship type “Spouse” will appear. Click on the “+Spouse” button and a spouse icon will automatically be added. Then, you will be able to add the relationship type: marriage, concubinage, divorce, separation, consanguinity. To do so, select two people at the same time by a “click and drag” with the mouse. You can also select two people by holding the “Shift” key and clicking on the icons at the same time. Both persons are now selected as they are highlighted with a blue square. Mouse over one of the icons to open the hint which displays the available family connections. Click on the icon that represents the relationship type you need. To remove a family relationship, simply click on the “- Spouse” button. 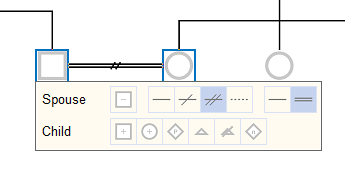 It is also possible to manage the relationship type setting from the data entry panel on the right side of the tree. If you need assistance, contact us at sales@pedigreexp.com.